Early on the morning of February 17, 1970, in Fort Bragg, North Carolina, a Green Beret doctor named Jeffrey MacDonald called the police for help. When the officers arrived at his home they found the bloody and battered bodies of MacDonald's pregnant wife and two young daughters. The word 'pig' was written in blood on the headboard in the master bedroom. As MacDonald was being loaded into the ambulance, he accused a band of drug-crazed hippies of the crime.So began one of the most notorious and mysterious murder cases of the twentieth century. Jeffrey MacDonald was finally convicted in 1979 and remains in prison today. Since then a number of bestselling books-including Joe McGinniss's Fatal Vision and Janet Malcolm's The Journalist and the Murderer, along with a blockbuster television miniseries-have attempted to solve the MacDonald case and explain what it all means.In A Wilderness of Error, Errol Morris, who has been investigating the case for nearly two decades, reveals that almost everything we know about that case is ultimately flawed, and an innocent man may be behind bars. In a masterful reinvention of the true-crime thriller, Morris looks behind the haze of myth that still surrounds these murders. 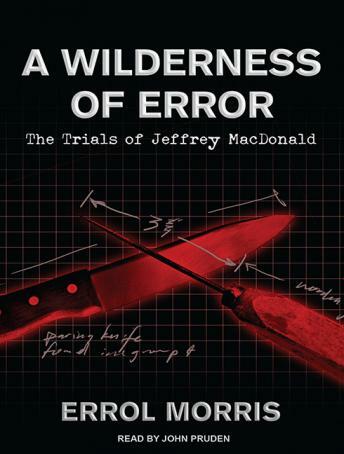 Drawing on court transcripts, lab reports, and original interviews, Morris brings a complete forty-year history back to life and demonstrates how our often desperate attempts to understand and explain an ambiguous reality can overwhelm the facts.A Wilderness of Error allows the listener to explore the case as a detective might, by confronting the evidence as if for the first time. Along the way Morris poses bracing questions about the nature of proof, criminal justice, and the media, and argues that MacDonald has been condemned not only to prison, but also to the stories that have been created around him. In this profoundly original meditation on truth and justice, Errol Morris reopens a famous closed case and reveals that, forty years after the murder of MacDonald's family, we still have no proof of his guilt.